Winter in England is cold, grey and snowy so we are dreaming of hot and sunny places, of tropical heat and exotic food – fragrant rice, spicy curries, pickles and chutneys, mangoes, papayas, coconuts, chillies, lemongrass, ginger … all sound exciting, warming and inviting. So we found ourselves in our local Sri Lankan Abina Supermarket on Hoe Street (opposite the Rose & Crown pub) buying ingredients we’d never seen before and dreaming of sunny beaches. 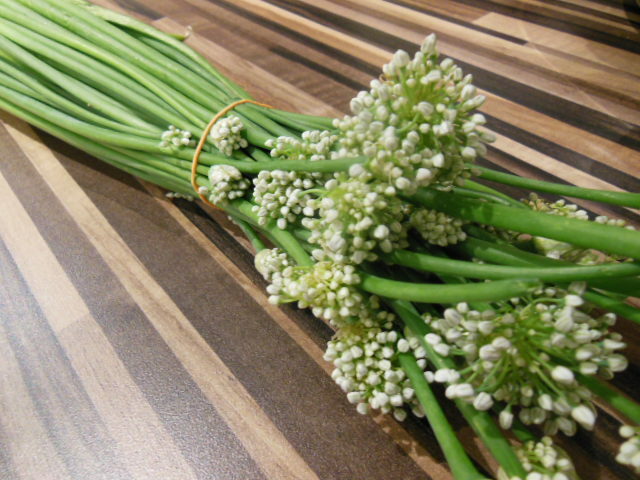 So we returned home determined to cook something exciting with the products we had bought – including these beautiful spring onion flowers. This is a quick, simple dish, inspired by Hugh FSW. You can use whatever seasonal greens are available – spring greens, brussels tops, leeks, kale, spinach or cabbage. If you can’t get hold of the Sri Lankan spring onions, standard spring onions would work and they’re often 3 bunches for £1 on the market. 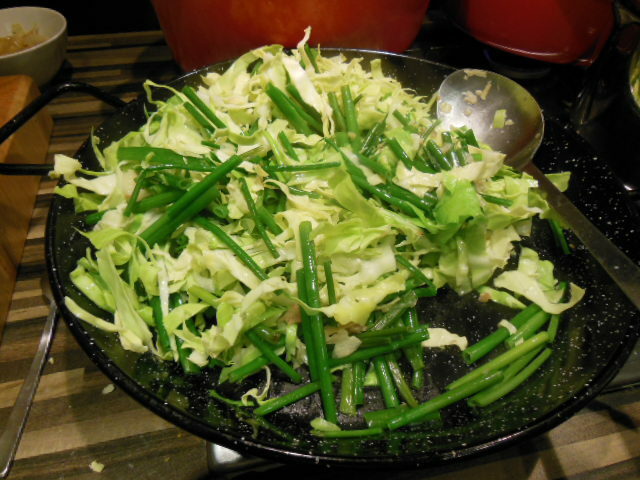 Trim the spring onions and cut into 5cm pieces. Wash thoroughly. Heat the oil in a large frying pan. Add the garlic and fry for a minute. Add the onions and fry over a gentle heat for a few minutes before adding the shredded greens. Continue cooking until soft but still with a bit of bite. Stir in the curry powder to taste, then add the coconut milk and simmer for 10 minutes. Serve with steamed rice as either a vegetarian main course or a vegetable side-dish. 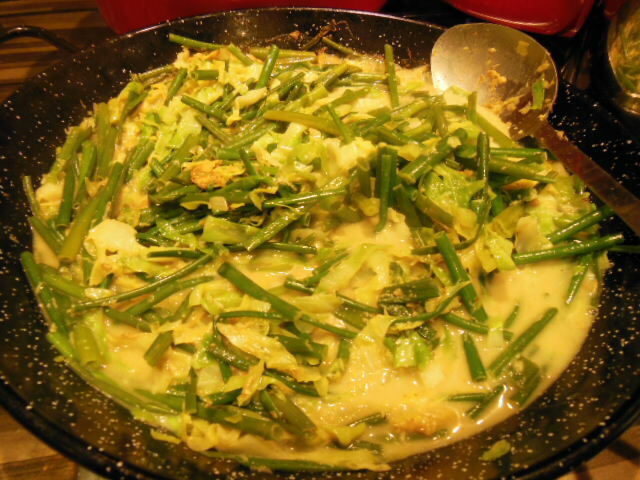 This entry was posted in Recipes and tagged Coconut, Curry, Spring greens, Spring onion, Spring onion flower, Sri Lanka. Bookmark the permalink. I`ve been dreaming of warmth too. So jealous of our friends in Australia in the middle of their Summer! You done it again you curry demons! agree but quick and easy and well blended on a mid week night – not everyone has the patience to start mixing , testing and grinding. I take your point. we do – cupboards full and two large indian spice tins! Curry powders are also in there and have their place. Thought you might have, as you are clearly quite adventurous…. What’s up Dear, are you genuinely visiting this website daily, if so then you will without doubt take nice knowledge.